At 4:15 a.m. today, multiple calls to 911 reported flames and smoke coming from the eaves of a house on Lexington Terrace in West Linn. With the help of neighbors and officers from West Linn Police Department, who were immediately dispatched to the scene, five occupants in the home evacuated unharmed. Firefighters from West Linn Station 58 were first on scene and found flames coming from the garage side of the house adjacent to several large trees. They immediately began an aggressive fire attack while other incoming crews helped search the house confirming all occupants evacuated. 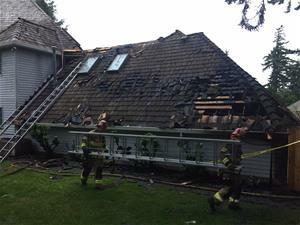 The fire quickly spread throughout the attic above the garage and ventilated upward through the shake roof. Firefighters continued efforts from multiple angles in order to keep the fire from spreading into the habitable areas of the home. The origin and cause of the fire is unknown; a TVF&R fire investigator is on scene. The residents and visitor staying with them are displaced since power was shut off to the home. TVF&R firefighters were assisted on scene by Clackamas Fire District 1 and Lake Oswego Fire Department. West Linn Police Department assisted with initial evacuations and traffic control to ensure the safety of the scene.